The hero is always on some type of adventure with a purpose--a quest if you will. He experiences many things on this quest, among which is a descent into a kind of "hell." In this hell he experiences a low point in his life that leaves him scarred forever with a real or psychological wound that will not heal. The hero learns from this descent into "hell" much about himself and usually matures greatly from the experience. 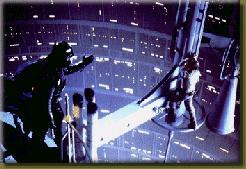 Luke in Star Wars perhaps illustrates this stage best. His quest, without knowing it at first, is to rescue his father from the Dark Side of the Force. Luke's descent into hell occurs when he decides to rescue his friends trapped on Cloud City, Lando Calrissian's gas mining operation. He leaves his Jedi training before it is completed to perform this rescue. 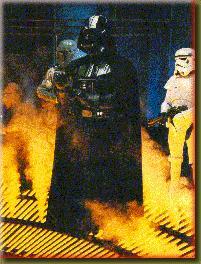 Luke is not prepared to face Darth Vader, who is waiting for him at the gas mine. Check this out. This scene (above right) is in the carbon-freeze chamber on Cloud City, where Darth plans to trap Luke. Does the lighting and characters remind you of anything? Thought so. In the duel that takes place between Luke and Darth in this chamber and beyond (right), Luke loses his hand and chooses to jump to almost certain death rather than give in to Vader's proposal to join the Dark Side of the Force. Luke's loss of his right hand in the duel is his Unhealable Wound. Clearly, this is the lowest point in Luke's journey to become a Jedi Knight and save his father. His wound and this low point teach him about himself, however, and eventually help him to become a true hero. Other heroes suffer low points in their journeys. Arthur never recovers from the affair Guinevere has with Lancelot. William Wallace knew his execution would make him a martyr, so he was courageous as he was in his "hell"--the dungeon. Moses' doubt of himself and Yahweh cause him to suffer his Unhealable Wound: denial of entry to the Promised Land. 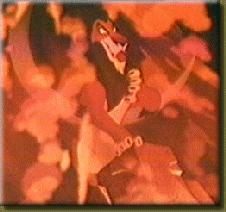 Simba's descent into "hell" is combined with his defeat of Scar and the hyenas. Remember all the flames in the background as he fights Scar? He symbolically goes where none of the other lions could go in order to help his tribe and prove himself. Simba's Unhealable Wound? His past, where his courage failed him and his tribe, will always haunt him.